Rig Vedic King and Sumerian King 2600 BCE! Research article No.1411; Dated 14th November 2014. Maha Sammata of Mahavamsa, one and the same? “Sammada= descendant of Sammada; is the patronymic of mythical Matsya in the Satapata Brahmana 13-4,3,12. “Satapata Brahmana Xiii 4,3,12 says King Matsya Sammada and his people are water dwellers. This cannot refer to Matsya country for their country was anything but watery. It appears in Vishnu Purana and Padma Purana about a Rishi called Saubhari. He saw a happy fish(man). He married fifty daughters of Mandhata”. Satapata Brahmana gives another name of a Matsya King, Dhvasan Dvaitavana . In short there was a king named Matsya Sammada, long ago. Mahavamsa (chapter 2) says that Gautama Siddhartha, the Buddha, was born in the race of a great sage called Maha sammata. Nobody knows who he was. Sumerian king list has two kings with the name Dumuzi. One was a shepherd and the second one was a ‘’fisherman’’. He ruled from Uruk around 2600 BCE just before the legendary Gilgamesh. His city was Kuara and he captured En-mer-baragesi single handed, says the cuneiform inscription. He ruled for 100 years. 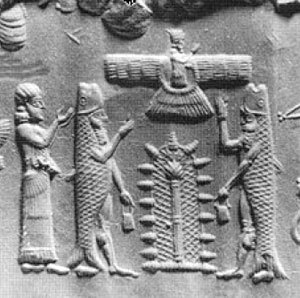 Dumuzi’s name is used for God, Goddess and several other people in Sumeria. So there is confusion about who did what.Indra in the Rig Veda is a god as well as a title for the king.Foreign scholars interpreted the hymns according to their whims and fancies. In the same way Dumuzi is also interpreted variously. Dumuzi is also called Tammuz in Sumerian literature and the Bible (Ezekiel). There are lot of things about him like the visit to underworld, Resurrection, Women Weeping for him similar to Hindu Mahabali’s Onam (Kerala) story and Kaman Festival (Manmatha burning by Shiva and Rathi’s lament). Actually it is a Spring festival, saying good bye to cold and drought. But our Dumuzi is not the consort of Inana or Ishtar, but a historical Dumuzi in the King’s list. His name corresponds with Matsya Sammada. Both are fisherman (Matsya in Sanskrit means Fish). Both are nearer to the time of Great Floods. In other words he is linked to the Flood story. Flood story is in every ancient culture. He may be the one who asked Manu (Nova in Bible) to select the best species from the world to survive the floods. But I don’t want to go deeper into the story and compare each and every detail. 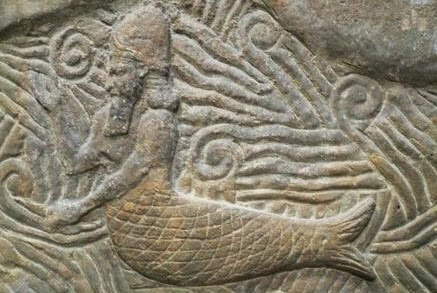 Other than the fish and the floods, Dumuzi was also a gate keeper in the heaven according to the Dictionary of the Ancient Near East. And in Hindu agama Kumara Tantram, Sumukan was one of the two Dwara Palaks (gate keepers). Sumerian kings were ritually married to Sumerian goddess Inana. There the kings are identified with Dumuzi. There are a number of rituals attached with different Dumuzis. One must be careful to compare Dumuzi with anything else. Tammuz is Sumkua in Sanskrit (T and S are interchangeable in many words. See English words with tion ending pronounced sion). My point is that there are amazing similarities between Dumuzi and Sumuka at one level and Dumuzi and Sammada at another level. Tammuz has been already identified with Dumuzi by all the scholars in the field. To sum it up, Dumuzi, Tammuz, Sumuka, Sammada and fish (Matsya) king are all one and the same. Since fisherman king Dumuzi ruled from Uruk at 2600 BCE we may give the same age to Matsya Sammada. Mr S B Roy has identified Emissum of Larsa with the Emusa of our Puranas and gave him a date of 2000 BCE. Emusa’s name occurs in the Varaha Avatara story. 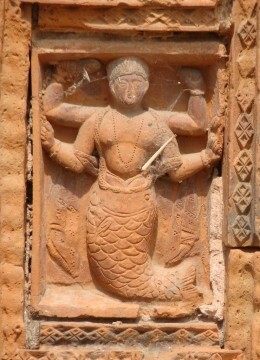 This Dumuzi is associated with earlier Fish/Matsya Avatar and so the date 2600 BCE is reasonable (The date of Dumuzi is taken from Wikipedia). 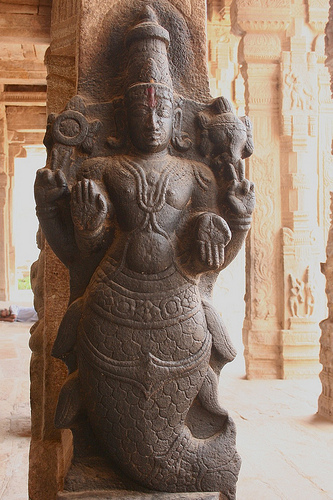 Does it mean that Hindu Varaha Avatara and Matsya Avatara took place in Sumeria? Since Sumerians are considered migrants from a foreign country by many scholars, the story must have happened in India and they took their memory to Sumeria. Another possibility is that a section of Sumerians might have migrated and settled in India and their story got amalgamated into Hindu Puranas. The interesting thing in the study is the occurrence of Sanskrit words Sumuka, Emusa, Su Meru, Tiamat, Azigi, Vizigi (of Athrvana Veda)in the Sumerian literature. Since there are 60,000 lines of Sumerian inscriptions, the more we study them, the more similarities may come to the fore. மொழிபெயர்க்க முடியாத ஒரு அற்புதச் சொல்!